Penn State sophomore quarterback Christian Hackenberg. Photo by Paul Burdick, StateCollege.com. How valuable is quarterback Christian Hackenberg to Penn State? In 2013, Hackenberg touched the ball – pass or run – on 48% of Penn State’s offensive plays. In 2014, it’s up to 62.5%, almost two out of every three plays. (Hackenberg has 35 runs and 195 passes for 230 plays overall.) At this rate, if he keeps it up for the next seven games, he’ll have the highest percentage for a Penn State quarterback over at least the last 35 years. At Vanderbilt, James Franklin expected a lot from his quarterbacks, who last year ran about 11 times and passed 29 times per game. The Vandy quarterbacks accounted for 58% of the offensive plays in 2013, 50.3% in 2012 and 58.3% in 2011. Kerry Collins, 1994, 37%. He had 276 total runs and passes that 12-0 season; Hackenberg, with 230 overall through five games, could very well reach Collins’ full-season number on Saturday. Zack Mills, 2002, 48%, and 2004, 44%. 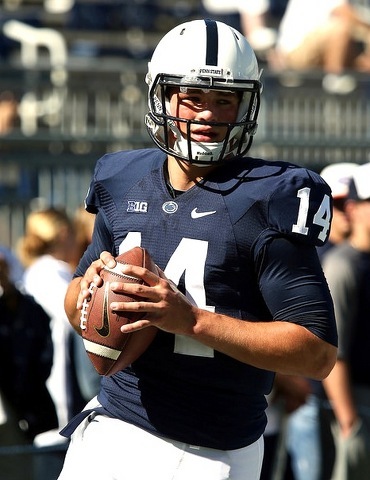 In just five games in 2014, Hackenberg has thrown more than 40 passes three times. And the Nittany Lions have won two of those games, making them 2-1 when their sophomore quarterback is forced to run – and pass – for his life. Contrast that with Franklin’s stops as a head coach, offensive coordinator, assistant head coach and/or quarterback coach: In 103 games at his three previous institutions from 2006-13, with Franklin running the offensive show, his teams threw 40 or more times in 16 games. And they won the same number of games as Hackenberg has in the past six weeks – two, making Franklin prior to Penn State 2-14 in games where his QB threw at least 40 times. With future NFL malcontent Josh Freeman at quarterback at Kansas State (2006-2007), Franklin was pass happy and results sad. Freeman started 21 times with Franklin as O-coordinator and was 0-9 when he attempted 40 or passes. In Franklin’s three-year stint as Maryland’s coordinator in 2008-10, Terp quarterbacks Chris Turner and Danny O’Brien attempted 40 or more passes a half-dozen times (three each) and came out with a 2-4 record. And yes, this is obvious: Teams playing from behind often will pass more to catch up. A poor running game, a weak offensive line and/or a stud at quarterback are all also reasons why a team may try more than 40 passes. Enter Christian Hackenberg, who is averaging 39 passes per game this season, with highs of 47 (Central Florida), 45 (Northwestern) and 44 (Rutgers). Hackenberg, a true sophomore, will be making his 18th consecutive start at quarterback on Saturday. Not-so-coincidentally, he’s been on the roster for 18 games. It’s an ascension to the throne with unprecedented speed and staying power, as far as Penn State is concerned. Of Penn State’s 11 wins with Hackenberg as the starter, Penn State has come from behind seven times to emerge victorious. Two of those came in overtime last season (Michigan, a four-OT game, and Illinois) and two came on Penn State’s final possession of the game in 2014 (UCF and Rutgers). Those last-second wins account for half of Penn State’s last eight victories. Michigan, 2013 – 5 plays, 80 yards, 29 seconds. Hackenberg completes 3 of 4 for 79 yards, and scores on a one-yard TD to force the game into overtime. Illinois, 2013 – 5 plays, 31 yards in 63 seconds to set up a game-tying 35-yard field goal. Completes 1 of 3 for 16 yards. Then, on the first possession of overtime, he completes two passes for 21 yards, including the 15-yard game-winning TD to Kyle Carter. Central Florida, 2014 – 7 plays, 55 yards, in 65 seconds to set up the game-winning 36-yard field goal. Completes 4 of 6 for 47 yards, plus runs for 8 yards. Rutgers, 2014 – 6 plays, 80 yards, 1:51, to set up the winning touchdown. Completes 3 of 4 for 84 yards. Combined, final drive only, not counting OT– 23 plays, 246 yards, 268 seconds, 11 of 17 for 226 yards, 2 runs for 9 yards and a touchdown. Hackenberg has been hampered by a ground game that has, save for Penn State’s 228 yards against UMass, not been very salvageable. The Nittany Lions have run for 57, 106, 64, 228 and 50 yards in their five games this season. The total of 505 ranks as Penn State’s third-worst output after five contests since it joined the Big Ten Conference in 1993. The 2000 Nittany Lions had 492 yards rushing after five games, while in 2001 they had just 376 yards. But both broke out of their shells in a big way in Game 6, with 221 (2000) and 213 yards (2001). 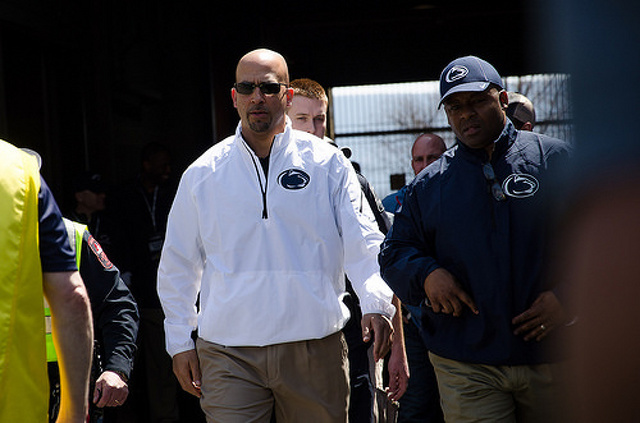 Before taking his team out on the road for this weekend's Big Ten game against Michigan, Penn State Head Football Coach James Franklin took to the airwaves for his weekly radio show. In a far-ranging conversation Franklin talked about everything from preparing for a night game to trick plays.